My name is Jacob Meister and I am the Editor-in-Chief of the Dartmouth Undergraduate Journal of Politics, Economics and World Affairs, an interdisciplinary, peer-reviewed publication from Dartmouth College in Hanover, New Hampshire. DUJPEW publishes integrative scholarship relating to politics, economics and international relations by current undergraduate students, and we are now seeking submissions for our 2019 issue. DUJPEW’s inaugural issue was published in May of last year and has since been downloaded thousands of times across six continents by educational, commercial, governmental, and military institutions alike. Scholarship in DUJPEW is seen by high-ranking scholars, public servants and professionals, instantly improving the reputation of our contributors’ work and providing them with further credibility in fields they may choose to pursue down the line. It is my hope that you will pass along this message concerning the opportunity to publish with our journal to your qualified students. DUJPEW looks to publish articles between 4,500 and 15,000 words, excluding citations and appendices, submitted by currently enrolled undergraduates at any accredited academic institution in the world. Our editorial board, comprised entirely of Dartmouth students and overseen by Dartmouth faculty, carefully examines all submissions relating to politics, economics and international relations in an effort to publish the most forward-thinking and relevant scholarship possible. For those interested in publishing with DUJPEW, the submission deadline for our 2019 issue is Sunday, March 31st at midnight (EST). For more information regarding our submission process and guidelines, as well as any other inquiries, please visit: https://digitalcommons.dartmouth.edu/dujpew/. Please join us for a panel discussion focused on how to make the transition to Data Careers. Data Scientists from Microsoft, KPMG and SAP Concur will be sharing best practices and answering questions on how they translated their academic background, prepared for interviews, and hit the ground running at their companies. Diversity and inclusion are guiding principles of the College of the Environment. The University of Washington acknowledges the Coast Salish people of this land, the land which touches the shared waters of all tribes and bands within the Suquamish, Tulalip, and Muckleshoot nations. The FIG program is looking for students from all departments who are UW-Seattle undergraduates with strong organizational skills and a genuine interest in working with freshmen as they face the challenges and opportunities presented to them as new students. 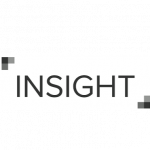 FIG Leadersteach a 2-credit course to new Freshman students in Autumn 2019! Orientation Leaders play a vital role in the orientation process, working closely with new students and their families on a wide variety of topics including academics, student involvement, housing options, and more. Orientation Leaders work during summer quarter and are paid 30-40/hrs per week. The application deadline is Sunday, January 27th! Applications are available online at fypadmin. UVic MA Economics Apply Today! 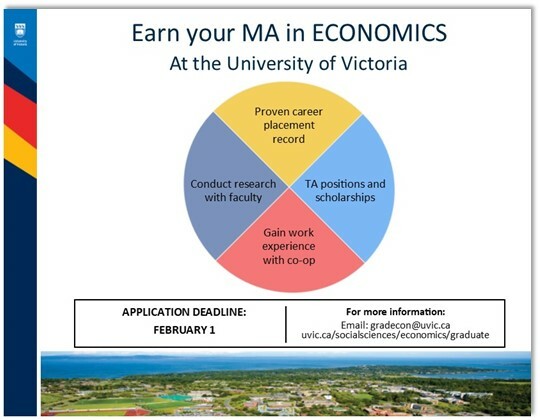 The Economics Department at the University of Victoria in British Columbia, Canada, is currently accepting applications for the September 2019 MA in Economics program. Our two-year research-based MA program covers a balance of theoretical and applied economics, offers a unique co-op program with exciting opportunities to gain professional experience, personal interactions with professors, many opportunities to conduct research, and has a proven placement record in high level public sector careers. The application deadline is in February 1st. Apply today! For the last 18 years, the Quantitative Methods in the Social Sciences (QMSS) MA program at Columbia University has been training graduate students to use sophisticated statistical techniques to thrive in an increasingly data-rich world. QMSS counts hundreds of data scientists, senior analysts and Ph.D.s among its alumni, working at top institutions like Google, Facebook, McKinsey Consulting, American Express, the Federal Reserve Bank, the United Nations, NYU, Princeton, Berkeley, and Duke. We are looking for students of the highest caliber who may be interested in joining our program. The application deadline for Fall 2019 admission to QMSS is February 15th. Apply HERE. We recently hosted a Virtual Open House, where we talked about what makes QMSS so special. Visit it here. Learn even more about us at qmss.columbia.edu. Why is QMSS such a uniquely valuable MA program? It not only offers rigorous interdisciplinary academic training, but it also provides amazing flexibility for students to pursue research across a broad range of topics. QMSS students enter with varying amounts of formal quantitative and social science training, but all of them graduate with advanced statistical methods applicable to many fields, including finance, data science, marketing analytics, social media, public policy, sociology, economics, political science or psychology. Academic Resources: QMSS continues to be at the vanguard of the ever-changing field of data science by updating and expanding our curriculum to reflect the latest methodological innovations. Courses added just within the last two years include Data Mining, Data Visualization, Modern Data Structures, Applied Data Science, Bayesian Data Analysis and Social Network Analysis. Other popular offerings include Geographic Information Systems (GIS), Econometrics and Time Series Analysis. QMSS also offers access to renowned faculty through our unique relationships with the various departments of the Graduate School of Arts and Sciences, as well as with Columbia’s many professional schools. Programs of Study: In addition to our Traditional Track, which offers the most flexibility for course selection, QMSS has developed four focuses: Flexible, Data Science, Economics, and Experiments. These tracks provide structured plans of study in specific areas of interest. We also offer the option of doing the program on a full-time or part-time basis. Research Assistantship Program: QMSS matches many of our students with Columbia faculty as RAs. Approximately a quarter of our students are currently working with faculty as RAs to produce original, cutting-edge research. QMSS Student/Alumni Engagement: QMSS is one of the oldest MA programs of its kind and therefore is proud to have produced hundreds of alumni who have gone on to have a large impact in a wide array of professions. Current students lead an on-campus organization that allows QMSS to actively engage current and former students in programs and academic discussions around innovative techniques for data analysis. If you have any further questions, please contact us at qmss, and we would be happy to answer them. Copyright © 2014 Columbia University, All rights reserved. You are receiving this email because you opted into receiving graduate program notification.